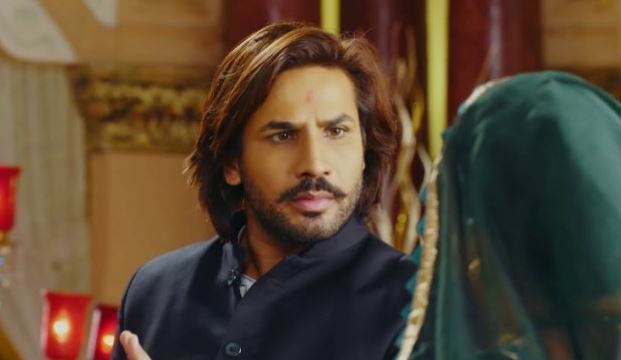 Adhiraj admits his hatred for Devi. He tells her that he hates her a lot, he acted to love her only to kill her and take revenge. Devi gets a big shock knowing this. She decides to make him understand the meaning of relationships. She wants to explain Adhiraj what a wife and marriage means. She is hopeful that his revenge and ill feelings will change when she makes him realize her worth. She knows marriage vows won’t make him understand the value of relations. She wants to make Adhiraj keep their relation. Adhiraj saves Devi, when she walks on burning coal. He keeps his hand under her feet and doesn’t let her get hurt. Adhiraj has changed. He doesn’t want Devi to give any Agnipariksha, when Maasa called Devi’s child illegitimate. He tells Devi that she doesn’t need to prove her purity. He turns humane. He tells Maasa that whatever Devi is telling is true, he believes her, its his child. Devi worries for Adhiraj’s hand burns. She gets happy that Adhiraj took a stand for her. She hides the fake pregnancy truth from him. She fears that he can know the lie and turn mad for revenge again. Adhiraj is protecting Devi only because of the child. Maasa gets angry on Adhiraj, when he supports Devi. He apologizes to Maasa. She vents out anger and slaps him. He doesn’t want Devi and his baby to get hurt. She doesn’t want Adhiraj to turn good towards Devi. She thinks Adhiraj started loving Devi. She sheds tears and emotionally blackmails Adhiraj.